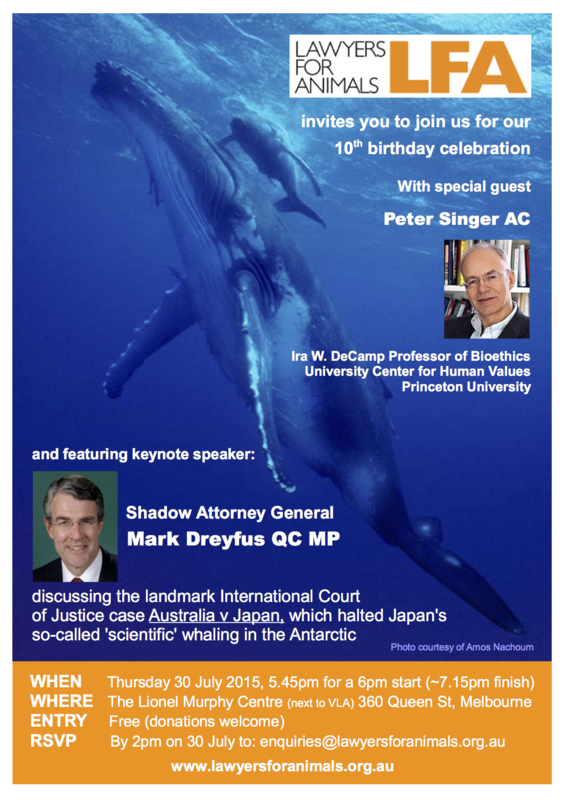 LFA is very pleased and excited to announce that internationally-renowned bioethicist and animal rights campaigner Professor Peter Singer will be joining keynote speaker Mark Dreyfus QC as a special guest at LFA’s 10th Birthday Event this Thursday evening in Melbourne. The event is open to the public and there are still seats available, but filling fast. RSVP to secure your spot. On 13 April 2015 the International Whaling Commission (IWC) released a report finding that Japan’s revised scientific whaling program provided no justification for the slaughter of whales for its purported scientific objectives. The IWC report concluded that Japan had not demonstrated that the culling of up to 333 minke whales a year for 12 years was necessary to meet the research objectives of obtaining more precise information on minkes, should the global moratorium on commercial whaling ever be lifted, and investigating the Antarctic marine ecosystem. Japan was forced to suspend its scientific whaling program following the landmark International Court of Justice (ICJ) ruling in 2014 that Japan was conducting commercial whaling under the guise of a scientific program in contravention of the 1987 IWC moratorium on commercial whaling. 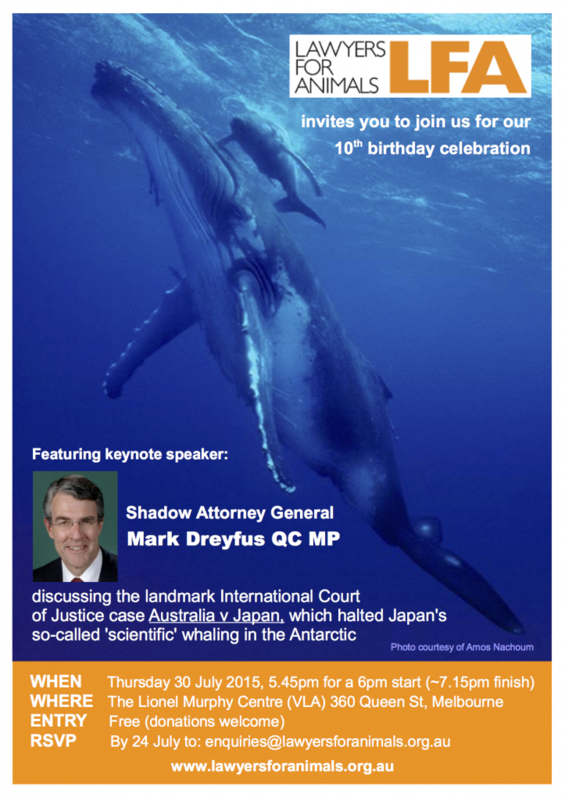 Japanese Prime Minister Shinzo Abe commented after the ICJ decision that Japan was committed to pursuing Antarctic whaling, and Japan’s commissioner to the IWC, Joji Morishita, has indicated that Japan will continue to pursue a scientific whaling program despite the IWC report. See more on this topic here (The Guardian) and here (Stuff.co.nz). On 14 April 2015 the full bench of the High Court heard an appeal challenging Knox City Council’s decision to destroy Izzy, a four year old Staffordshire Terrier. Izzy had been detained by the Council following attacks on other dogs in August 2012, May and June 2013 after Izzy and two other dogs had escaped from their owner’s yard. The High Court transcript can be found here. The Council decided to destroy Izzy in October 2013, after representing to Izzy’s owner, Ms Tania Isbester, that it would not do so. Ms Isbester challenged the Council’s decision through the Victorian courts, claiming the Council’s decision makers were affected by apprehended bias, bad faith, did not consider whether Izzy should have instead been declared a “dangerous dog” and did not afford Ms Isbester procedural fairness, among other grounds. The Victorian Court of Appeal upheld the Council’s decision in September 2014. Ms Isbester was granted leave to appeal that decision to the High Court on the basis the Council’s decision was affected by a conflict of interest. This is the first case regarding a local council’s decision to destroy an animal to reach the High Court and, although based on administrative law grounds, the case is likely to provide useful guidance on the procedural requirements local councils must follow when investigating and deciding penalties regarding dogs. The crux of Ms Isbester’s argument is that Izzy did not receive a fair hearing by the Council when it was considering what action to take in response to Izzy’s involvement in the three attacks on other dogs, which involved two other Staffordshire Terriers owned by Ms Isbester, one of which had already been destroyed by the Council. The Council officer that had investigated those dog attacks and charged Ms Isbester was a member of the panel convened by the Council to hear the charges and decide the penalty. Ms Isbester has argued before the Victorian Courts and the High Court that the Council’s investigator played an influential role in Magistrate’s Court proceedings brought against Ms Isbester as Izzy’s owner, and the Council’s decision to destroy Izzy. Ms Isbester’s legal representatives submitted that the participation of that investigating officer in the legal processes involving Ms Isbester and Izzy amounted to them acting as both accuser and judge, creating an apprehension of bias and a conflict of interest that affected the Council’s decision-making process. Izzy has been detained by the Council since June 2013. On 17 February 2015, the day following the Four Corners program exposing the live-baiting scandal that rocked the national greyhound racing industry, the Victorian Racing Integrity Commissioner announced an inquiry into the live baiting allegations, and the Victorian Government announced a broader investigation into the greyhound racing industry by its Chief Veterinary Officer. On 11 March, the Racing Integrity Commissioner delivered an interim report to Government that found, among other things, that it would be naive to assume that live baiting practices were not being carried out at training facilities in Victoria other than the Tooradin Trial track discussed in the Four Corners program, and that, on the balance of probabilities, Greyhound Racing Victoria could not have been expected to know about live baiting practices given their purportedly limited investigation powers. The Racing Integrity Commissioner proposes to deliver his final report on 30 April 2015. Following Victoria’s lead, the NSW Government announced on 4 March 2015 the establishment of a Special Commission of Inquiry into the State’s greyhound racing industry to investigate animal welfare and integrity issues. This announcement came after the entire board of Greyhound Racing NSW was sacked by the Minister for Racing. This announcement follows the discovery of the mass-killing of 55 greyhounds in bushland near Bundaberg, Queensland, for which two people have been charged with more arrests possible. So far, however, Queensland greyhound racing officials have remained in office, with Racing Queensland’s general manager of stewards and integrity operations returning to work on 21 April 2015 after being stood down temporarily. Given evidence of past and present practices across the national greyhound racing industry, Lawyers for Animals considers this industry is unlikely to meet the public’s expectations of decent and ethical treatment of animals. Lawyers for Animals calls for laws prohibiting animal cruelty to be properly enforced against greyhound trainers and racing venue operators, and for greyhound racing to be phased-out throughout Australia. Senator Chris Back’s Criminal Code Amendment (Animal Protection) Bill 2015, which seeks to criminalise private investigations into animal abuse, also known as an ag-gag law, was referred to the Senate Standing Committees on Rural and Regional Affairs and Transport on 12 February 2015. Submissions closed on 12 March 2015, and the Standing Committee is scheduled to hand down its report on 13 May 2015. Animals Australia and Animal Liberation Victoria are both gathering signatures for petitions opposing the proposed bill. A discussion paper on ag-gag laws in Australia prepared by the RSPCA can be found here. Also see LFA’s earlier post on this topic. On 11 February 2015 Senator Dr Chris Back, a former veterinarian turned oil-magnate, introduced the Criminal Code Amendment (Animal Protection) Bill 2015. The purpose of the Bill, according to the Explanatory Memorandum that accompanied it, is to “minimise unnecessary delays in the reporting of malicious cruelty to animals.” Curiously, however, the criminal offences which the Bill seeks to add to the Criminal Code are all directed at individuals who either become aware of “malicious animal cruelty” and do not immediately report it to the police, or who interfere in the operations of an “animal enterprise”, rather than any person involved in carrying out malicious animal cruelty. Although disguised as a Bill to promote stronger policing and prevention of animal cruelty, the provisions of the Bill are aimed at stopping animal rights groups from obtaining photos or video footage of animal cruelty or mistreatment, and subsequently using that material in public campaigns against the businesses concerned. Similar laws have been pased in the United States, known as ‘ag-gag’ laws (read more here). Under this Bill, individuals could face penalties from a fine of $5,100 for failing to report acts that they believe are “malicious animal cruelty” to the Police within one business day, to life imprisonment for damaging property belonging to a person connected to an animal enterprise with the intention of interferring with that animal enterprise. Senator Back has said his Bill would have seen such live baiting practices investigated by the authorities sooner, becuase the journalists investigating the live baiting offences would have been compelled to provide their material to the authorities. The counter argument is that ag-gag laws would have a significant chilling effect on the ability of independent organisations to investigate animal cruelty practices. Such public scrutiny is arguably needed most in industries where the statutory bodies designed to regulate the industry repeatedly turn a blind eye to breaches of the law (the greyhound racing and live export industries are good examples). The Criminal Code Amendment (Animal Protection) Bill 2015 is currently before the Senate. Voiceless, an Australian animal protection institute, has released a comprehensive report on the Australia dairy industry titled The Life of the Dairy Cow. The report shines an informed and considered light on the impacts of an industry that few people think about. For most Australians, consuming milk and dairy products is a daily activity carried out for life. Few people stop to consider where dairy milk comes from, how it is produced, or even why humans drink so much cows milk. It is something we learn from a young age and never think to question. The Voiceless report provides a detailed examination of the welfare of dairy cows and the ethics of standard dairy industry practices. Key areas of concern are the continuous cycle of pregnancy and birthing, the separation of calfs from their mothers, the slaughter of newborn calfs, and the animal husbandry practices of dairy farmers. Given the Australian dairy industry is the third largest agricultural sector in Australia, with a combined farm, manufacturing and export value of $13 billion, the Voiceless report raises important considerations that are ever-present in balancing the welfare and rights of animals with the commercialisation of farming. A copy of the Voiceless report can be found here.